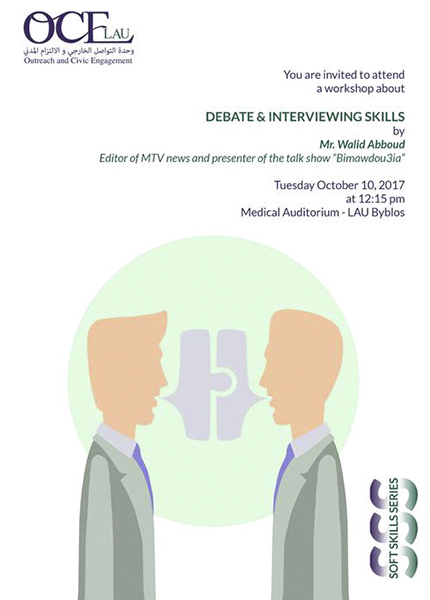 Walid Abboud is the editor of MTV news and the presenter of the talk show “Bimawdou3ia”. He has hosted a number of well- known figures to discuss the latest developments for a better understanding of the political and socio-economic parameters. He was also a journalist previously responsible for the Nahar al-Shabab supplement, part of the Nahar newspaper. Transportation from the LAU Beirut lower gate will be provided at 10:00 am. Return will be from the LAU Byblos lower gate at 2:00 pm. To attend, kindly register here preferably before the 8th of October 2017.